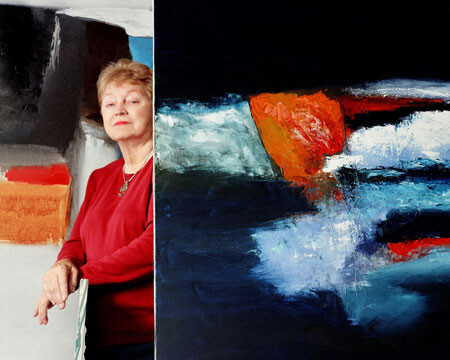 Her oil paintings bring the emotional palette of impressionism to the world of abstract art. “I am usually referred to as an abstract artist but perhaps my work should be called abstract impressionism, because the work comes from memories of things I’ve experienced in life. The colors and shapes I use refer to places I’ve seen or music I have heard. These images dwell in my mind and haunt me like ghosts of things past until they compel me to commit them to canvas or paper,” said Hunter. A native Washingtonian, her career began in the early 60’s when she helped found a gallery in Georgetown, Washington, D.C. Her work has shown in a number of galleries on the east coast from Miami to Montreal. She had work in the Corcoran Gallery of Art, the Smithsonian Museum, the Baltimore Museum and the Walters Museum to name a few. Her work is represented in a number of public and private collections and was included in the Federal Art in Embassies program. She came to California in 1984 and joined Studio ’83 and the Buenaventura Art Association. She was a member of the Buenaventura Artist’s Union, the Studio Channel Islands Art Center and shown her work there plus the Carnegie Museum. She was represented by Accolades Gallery in Ventura. Dorothy Hunter’s documentation took place in 2004 and was sponsored by Jordon and Sandra Laby. The FOTM Archive contains extensive information about this artist.